Welcome! You have found Taste of Italy, the place to find one of the largest collections of everything Italian. Aprons, Hats, Keychains, and much more! 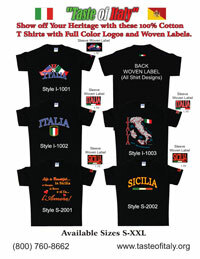 We also market our products to the following: Italian Festivals, Italian Restaurants and Delis, Gift Shops, Parties, Fundraisers, Organizations and Clubs. Call for further details and information on wholesale pricing. NEW PRODUCTS - T-SHIRTS & MORE! VIEW OUR NEW INTERACTIVE CATALOG! © Taste of Italy dba Tasco Products. All rights reserved. No content, products or designs on this may be reproduced in any form without permission. Any infringement of copyright will result in legal action against people or organizations illegally reproducing copywritten material for their own purposes.